Attention seeking behaviour.. ehh ? 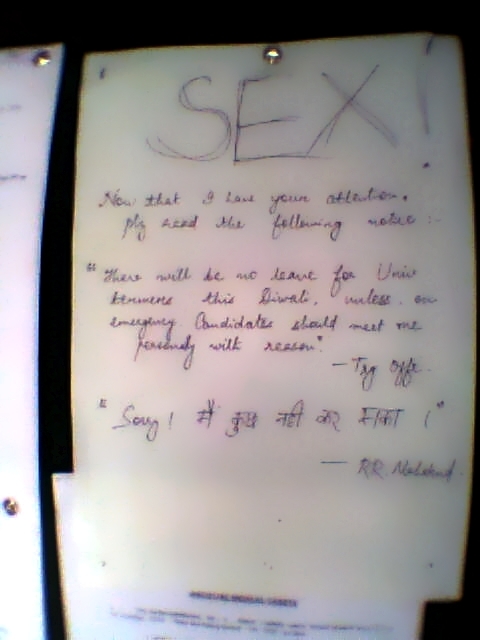 Below the obvious *** it reads.. "Now that i have got your attention, please read the following notice- There will be no extra diwali vacations for university going terms this year." Well, i guess that's pretty mean of you to cut our vacations. But, who cares ? It's going to be preparatory leave anyways. p.s. Watson who was sitting besides me and have just read this, is nudging me to delete this as soon as possible or both of us might be rusticated for ...well ..some reason or the other. 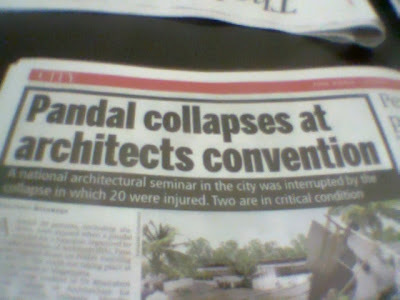 As far as the story goes, the people at the pandal (..that is a word for 'tent' in hindi) were supposedly there for an architectural convention. There were apparently a lot of big architects from all over the country inside, and dozens of students of course. And then, all of a sudden it collapsed like a pack of cards... BANG.. ..just like that. 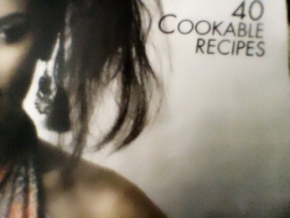 I hope my recipe is cookable ! I noticed this fascinating title on the front page of Women's Era today.. and i thought that it is my moral responsibility to show this to my dear readers. p.s. Dear Watson i wasn't really reading Women's Era ..it was just lying on a table and i clicked this pic. I Swear !! !